Until recently I never had a skincare routine. I was just too lazy to follow all the steps every single night and taking my makeup off and going to bed sounded much easier. First of all, I take off my makeup with Superdrug Facial Cleansing Wipes. They are incredible in my opinion. I tried a lot of wipes before and they all left a greasy feeling on my face and the oil inside them didn't take off my makeup properly. This one just takes off a lot of my makeup, doesn't leave an oily feeling on my face and apparently it also cleanses, tones and moisturises your face. It's quite cheap as well(99p). I think it's a win. After I get rid of most of my makeup with the wipe I use Garnier Micellar Cleansing Water and exactly 4 cotton pads to get rid of the rest of my makeup and fully cleanse my skin of the dirt that is left off. I use a cotton pad on the whole face, use one for my left eye, one for the other eye and a last one to go over the entire face one last time. It sometimes feels oily to me so I just splash some water and wipe my face. It is pretty amazing when it comes to getting rid of all your makeup and this goes a very long way. It retails for £3.33 for 400 ml which is a bargain. After I take off all my makeup and fully clean my face I use this beauty; Enozone Anti Acne Lotion on my blackheads and pimples. This is actually from a start up company my dad works with and I'm so glad I got to encounter this product. It is a lifesaver when it comes to pimples. You can spray it all over your face or use it on a cotton pad(I prefer this) and when I have a spot I want to focus on the most I just use a cotton bud and apply it to that area. The pimple goes away in almost 24 hours which is more than what I'm asking for. The only downside is that once you use this you can't put on anything for an hour otherwise it won't work. So I have to use this an hour before I use my moisturiser. I have been loving this product. This is Estee Lauder Advanced Night Repair Serum and it works as an enhancer. I use it before my moisturiser and it helps your skin feel younger and gets even more hydrated. I first saw my mom using this and as I got more into looking after my skin I saw a lot of bloggers use this as well and thought I'd give it a try. I definitely don't regret it. The formula is great and in addition to its awesome features it has a very good scent to it. It's more on the pricey side with £69 but worth every penny. Lastly I moisturise my face using either of my favourite moisturisers which are both from Clinique. I first started using the Moisture Surge Intense which was very good and left my skin feeling very hydrated and fresh but I recently got my hands on the Dramatically Different Moisturising Lotion and it is by far the best moisturiser I've ever tried. This made the most difference to my skin. I never noticed how dried up my skin was before I started using this but after a couple of days I touched my face in the morning and my face felt so soft and fresh you wouldn't believe it. It makes my skin feel so healthy and I just absolutely love it. I definitely recommend it and once I run out of the tester I'll get the full size in a blink. 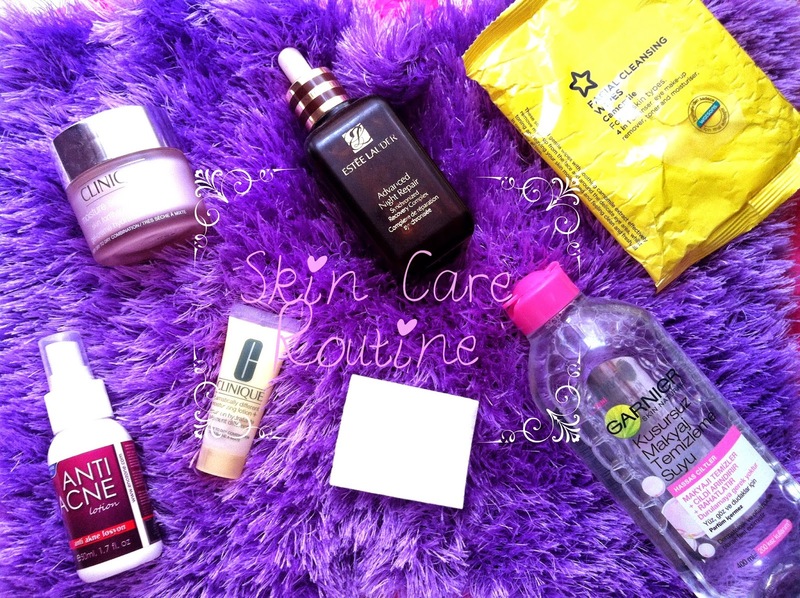 Great skincare routine, you must have glowing skin :) I love using garnier micellar water too! I'm probably on my 4th bottle!